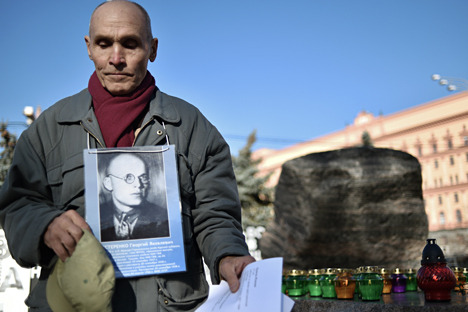 A man holds his father's portrait near the memorial to the victims of Soviet-era political repression, the Solovky Stone monument, on Lubyanka Square in Moscow, on October 29, 2014. Russian President Vladimir Putin has signed into law a bill reinforcing the right of central-government bodies and local authorities to conduct measures to perpetuate the memory of the victims of the political repressions and provide support for nonprofit organizations involved in such efforts. The bill was proposed by the Russian government. The law reinforces the right of central-government bodies and local authorities to conduct measures to perpetuate the memory of the victims of political repressions and to support such efforts made by organizations and citizens. The law also makes local authorities liable, in the event of a discovery of mass graves of the victims of political repressions, to apply to a regional cultural heritage protection agency for the site to be included in the state register of cultural heritage sites (historical and cultural monuments) of the Russian Federation. Given civil society institutions' role in the cause of perpetuating the memory of victims of political repressions, the law proposes that such organizations involved in perpetuating the memory of victims of political repressions be added to the list of socially-oriented nonprofit organizations entitled to central and local government support. The document was published on the official legal news portal.